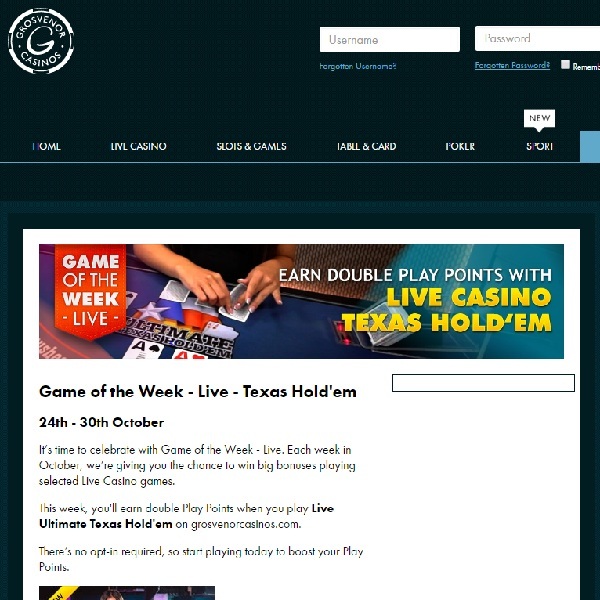 It is the final week of Grosvenor Casino’s Game of the Week Live promotion offering you big bonuses for playing selected live casino games. This week the chosen game is Texas Hold’em. All you have to do is head over to the casino and start playing the game and you will immediately start to earn double Play Points. These points can then be exchanged for a variety of rewards and even cash so the more you play the more rewards you will earn. If you haven’t yet tried live dealer gaming then you’re in for a treat and Live Dealer Texas Hold’em brings the excitement of the world’s most popular poker game straight into your home. Head over to Grosvenor Casino today and start playing to earn your double points and reap rewards all week long.